Another month is here, and with that, it’s time for more goals! I’m really loving keeping myself accountable each month by setting these goals. Even if when I fail, it still feels good to strive for something all month long. But before we get to my August goals, let’s recap July. I FINALLY accomplished this goal! After months of coming up just shy of three books, I blew it out of the water last month and read FIVE! I’m pretty excited about not only meeting my goal, but completely exceeding my expectations. 2. Co-host a blog giveaway. Check! It’s actually live right now and you should totally check it out. Seriously. Sadly, this one didn’t happen again this month. I give up lol. 5. Try a new recipe. Yes! Not only did we try a new recipe, but it was a big hit! Be on the lookout for the recipe to come to the blog soon! Fail…’ish’. I kind of did this but kind of didn’t. I definitely didn’t get as much as I wanted to done, so I’m calling it a fail. But I got started at least! So, that’s a plus in my book. I’m hoping to keep my progress going and read another three books this month. Fingers crossed for good results like last month! I’ve been feeling kind of crappy lately, and I know a lot of it has to do with my eating habits. I want to drink a lot more water, eat better, and lose some weight! I know weight loss is a BIG goal that won’t be accomplished in a month, but this month I really want to focus on eating smaller food portions and making better food choices. And water. Much more water intake would be amazing. I started this study with the First 5 app, purchased the Book of John Experience Guide, and finally have an amazing Bible that I absolutely love. I’m a few days behind in the study, but I want to catch up and finish this study this month. I have a bad habit of just dropping studies halfway through, and I’m vowing not to do that this month. I’m keeping this one on the list until it happens. It’s quite sad that it hasn’t happened yet, but this summer has been hectic! Here’s to hoping it actually can be accomplished this month. I have yet to finish editing the pictures from our cruise last year, and it’s seriously pathetic! They are getting done this month, for sure. There’s no other option at this point. It’s coming up to a year since we went and to not have the pictures and posts done is just tragic. I’ve been setting monthly goals and sharing them on the blog for two months now, and it really makes me aware of just how fast time flies. I seriously cannot believe it’s already July! Half of 2015 is now over and I have no idea where the time has gone. Seriously. Setting and sharing these goals also has made me more conscious of the fact that I fail EPICALLY at reaching my goals. In the beginning of the month, they seem completely attainable and it feels as if 30/31 days is plenty of time to accomplish such small tasks. But when the end of the month comes around and I am going over them, I just bow my head in shame. For some reason, I just can’t do it all. It doesn’t help that I’m only “home” 3-4 days a week, for a few hours at a time. I’m home long enough to sleep, get in some reading, blog a little, shower, do some laundry (maybe), and eat supper. That’s it. A few hours a night and time is up. So, it’s no wonder why some of these things don’t get done. HOWEVER, it won’t stop me from setting goals for myself each month. I really like the accountability that sharing them gives me, and one of these days, I’m going to be successful at meeting each monthly goal I set for myself. One day. And that day is not today…so let’s recap June’s goals to find out why, shall we? Fail. Again. I got 2 out of 3 for the second month now, but another two pretty great reads! Head over to check out what I read in June here. I’ve had this goal in May AND June and have come up short both times. Again, I was close but not quite closet enough. Time just really sneaks away from me! Done! I sponsored Life As Rachel and The Samantha Show. These two girls are very different but both hilariously funny and entertaining in their blog presence. Go check them out. You won’t be sorry! It was a big, fat, fail on this one. I didn’t even get started on this goal. See above, wherein I explain that I’m only home for a few hours a night a few days a week, and I just didn’t get around to this one. This one was hit and miss. I’m going to say that I failed because it didn’t happen quite as I had hoped or anticipated, so I can’t count it as a success. Sad day. Okay, I’m trying this AGAIN. Third time’s the charm, right? 😉 Let’s see if I can break the cycle and go 3 for 3 this month. Since this didn’t happen last month, it’s even more crucial to get this done in July. It’s just way overdue and totally necessary for me to be more efficient in everything else that’s going on. Especially laundry. Clean, dirty, it’s just chaos. It’s time to reign it all in and take care of it. Oh, and mail. It’s everywhere, and it’s a problem. Time for my room to get a facelift! And by facelift, I just mean not cluttered in junk and clothes. Again, even organized chaos would make me happy. I keep beating myself up about failing things (like monthly goals) and not meeting my own expectations in so many areas. But this month, I want to try to really give myself grace. I’m in a phase of “new” (again), and it’s been a lot different than anything I’ve known. I live at home with my parents, I commute to work 2 hours one way, and I got a promotion at work, so that means a new job function in which I’m trying to stay on top of (and am succeeding at, don’t worry 😉 … hehe). I’m also putting time in with my sister one day a week and focusing some time and energy on my relationship with Cory. All of that together leaves me exhausted and some things lacking. I don’t have a routine, and while that stresses me out, I can’t let it get me down. Grace. It’s all about extending a little grace. And I’m focusing on that this month something fierce. I’ve seen so many good recipes that fellow bloggers and people on Facebook are trying and sharing because they’re delicious. I’m determined to try something new! I’m so far behind in editing my pictures, and I want to make some headway with that this month. Photography is a passion of mine, and I don’t want to let it get too far behind to where I feel completely overwhelmed and let it all go. That’s unacceptable, so I want to work on that. I can’t believe it’s already June. Seriously, it’s already summer! And seeing as I’m a cold-weather girl, I’m really not looking forward to the humid Texas heat that’s headed our way. It’s already been in the 90’s this week, so it’s looking like a HOT summer is in store. Yikes! Check! I met with him and the ball is now in my court to complete the giant stack of paperwork that’s required to move forward. I failed to reach this goal, but 2/3 isn’t bad for my first attempt! Check out my May reads here. Yes and no. I got through some, but not quite the amount I would’ve liked. However, since I did get through a good amount, I’m calling it a win! Sadly, no. I was working on my blog getting a facelift, and I dropped the ball on sponsoring. Yes! I am happy to report that this absolutely happened and I am super excited about the results. More on this later. I didn’t count them officially using the MyFitnessPal app, but I was definitely more aware of what I was eating and the calorie intake. I’d count that as a step in the right direction. 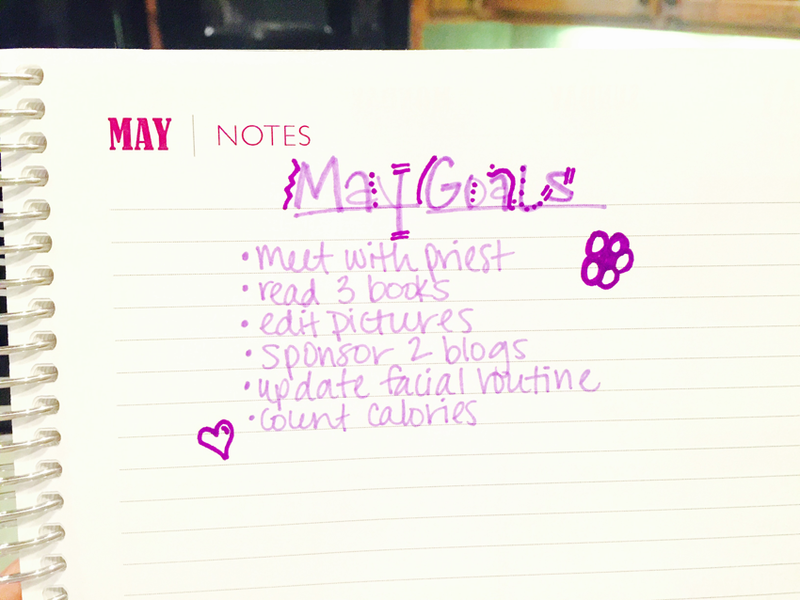 And now for my June goals! Yep, I’m trying this one again. I came close last month, so I’m determined to get those three under my belt! Another repeat from last month! It’s going down this time :). Living back home, I have one room to keep all of my stuff, which means there are things everywhere and it’s more important than ever to stay organized. Well, it’s definitely overdue to reorganize and clean it up. I’d be happy with organized chaos at this point. I keep a journal for prayers, on behalf of myself, family, friends, strangers – just whatever is on my heart. I haven’t been very consistent with it lately (surprise, surprise…) and really want to make a point to get back on track. Even if it’s only 5 minutes a day – it doesn’t take much! What are your goals this month? I can’t believe it’s already May! This year is seriously flying by, and we’re already 5 months in. Holy wow! But I’ve decided that May is the perfect time to really get serious about some goals. No matter how small, I need to hold myself more accountable for the things I want and need to get done. So, here we go! It’s time to meet up with my priest so that I can continue moving forward with life after divorce. There are still some loose ends to tie up and I need to get the ball rolling this month. It’s time. As with everything else I’ve been slacking on lately, I really, really want to make some progress on editing some of my pictures I’ve taken recently. It’s something I truly enjoy and am looking forward to spending some time with it. Big changes are in store for this here blog, and I’m so excited! I can’t wait for things to unfold and to take another step in taking this blog to the next level – whatever that even means. Ha! But this month, along with some other changes, I want to sponsor 2 blogs that I enjoy reading. I’m in some major need of an updated facial routine. Cleansing, moisturizing, make-up, etc. I’ve noticed that I just need a few improvements here and there, and instead of constantly telling myself that I’ll get to it eventually, May is the month! I’m determined to get back on track with using the MiyFitnessPal app. I definitely don’t want to watch every little thing that I put into my mouth, but I want to be more aware of just how many calories that is. If I go over the daily amount, that’s okay. I just want an improvement, not a miracle. If you want to follow along and help keep me accountable, find me on the app: xobriannaleigh. What are you looking to accomplish this month? I’m BRIANNA!first time mamalover of Jesuswannabe photographerSweet tea is my weakness and making lists is my jam.